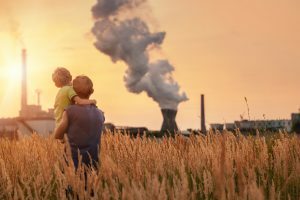 Numerous studies have established the adverse effects of poor air quality on human health. The 2017 European Union Air Quality Report attributes over 487,600 premature deaths in the EU to three common pollutants; PM2.5, O3, and NO2. To improve the measurement of air quality, governments are encouraging industries to use innovative near-reference air-monitoring devices along with traditional reference stations. Governments are increasingly using these new affordable near-reference devices to isolate specific polluted areas in cities and notify citizens. To improve worker productivity in offices, office buildings are also installing these devices to detect poor indoor air quality. As the demand for this new technology is increasing, it is important to understand that not all near-reference air-monitoring devices are the same. You must keep a few factors in mind before making your purchasing decision. The answers to these questions determine the ideal sensors and air monitoring device for your needs. 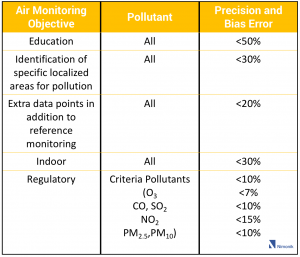 For example, if you are a university student and are collecting data to demonstrate local air pollution, you do not need utmost accuracy and precision. You can rely on near-reference air monitoring devices that provide near-accurate results. Near-reference devices are also a good solution for NGOs, public bodies or anyone who is not bound by permitting requirements to monitor air quality. But if you have mining, construction or oil & gas operations, then you likely need a combination of reference stations and highly accurate near-reference air monitoring devices to obtain satisfactory results. Pollutants are present in different concentrations in ambient air depending on the proximity to the pollutant source. 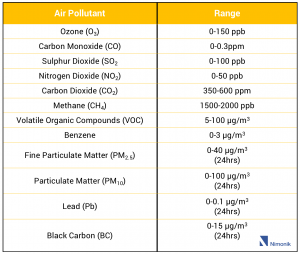 The common pollutants’ average range (minimum to maximum concentration) in outdoor air is listed in the table below. Once you determine the pollutant you need to monitor, you must ensure that the sensor you choose is sensitive across the entire range of the pollutant. 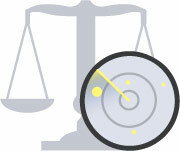 Precision and bias determine the overall accuracy of the sensor. Precision is the number of times the sensor reproduces the measurement under identical circumstances. Bias is the error in the sensor, how much higher or lower than the true measurement does the sensor measure. The acceptable ranges for bias and precision are given in the table below. Depending on your monitoring objective, you must ensure that the sensor has no more error than suggested in the table below. If your objective is to measure rapid changes in pollutant concentrations then a portable device that takes measurements in real-time would be much more suitable than a stationary device. If you need data over a period of time then you can use a stationary device. If you plan to measure outdoor air quality then your sensor must be weatherproof as varying temperatures and weather conditions can damage the delicate sensor. Outdoor monitoring stations come with a package. In addition to ensuring that the package is weatherproof, you must pay attention to the packaging material. Plastic coating in packages can react with pollutants, thus skewing the measurements. Sensor usability refers to the ease of operating the sensor. Sensors that provide ultimate accuracy are usually challenging to operate and need an advanced operator. If your project involves community engagement then you should opt for an easy to use sensor. The cost of an air monitoring device varies with the sensor’s sensitivity and accuracy. The more accurate the results the more expensive the device. Unless you need results with absolute accuracy, you should prefer portable, new-generation air monitoring devices to the highly expensive stationary reference stations. Even if you are required to monitor air quality to utmost accuracy, you should use the modern air-monitoring devices to supplement the data from the reference stations for better results. The process of charging the sensor battery and data transmission from the sensor too should influence your decision. Air quality impacts our health and productivity. It is important to ensure we breathe good quality air. Near-reference air monitoring devices are an emerging technology that have indoor as well as outdoor applications. They help us set controls and take timely protective measures when the air quality begins to deteriorate. But all near-reference devices are not the same. You should choose your device carefully keeping in mind a clear objective and factors like detection range, ease of use, remote control, data transmission etc.